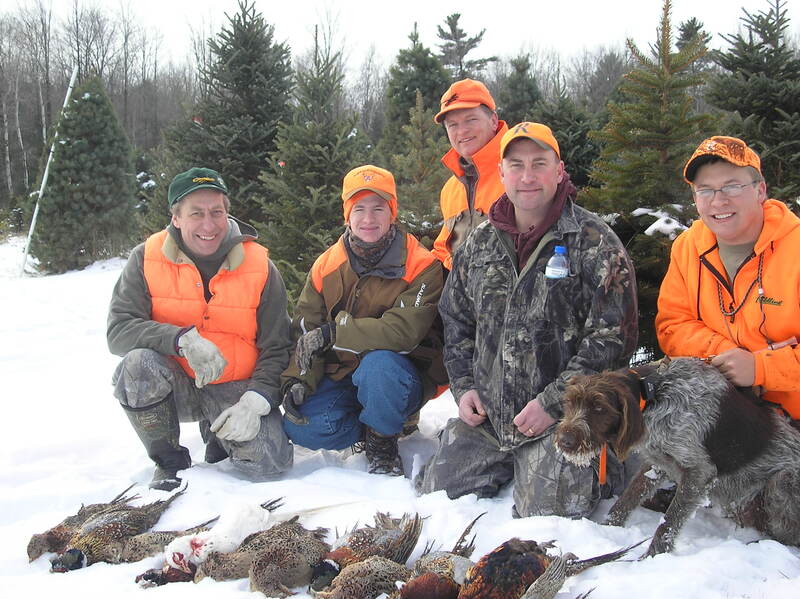 Hunting pheasants with family and friends on a crisp autumn day at one of Wisconsin’s many preserves can be an enjoyable experience. Beauty of the outdoors, exercise, great company and hopefully a wonderful pheasant dinner all create fantastic memories. When to schedule a hunt- Most preserves and clubs are busiest on Saturdays and October is the most popular month. If scratch birds are available (usually discounted), Mondays after a busy weekend will offer the opportunity for more birds. It’s more peaceful without gangs of hunters and offers the opportunity to have extra flushes. Sunday afternoon might be your next best bet. Also, keep in mind that you normally hunt birds less than a year old. Early in the fall birds tend to run less due to more cover and being smaller in size. Later in the season, birds will be slightly larger and will tend to run more on the ground with less cover. Weather– Check ahead of time to see what happens if poor weather is expected the day you reserve a hunt. Can you re-schedule? Birds will not fly as well on cloudy, rainy days. If they do fly, it’s often low to the ground, preventing a safe shot. I’ve also found that temperatures below 10 degrees often result with birds sitting too tight and needing nudges to get air born. A little humidity will also aid in your dog’s ability to scent birds in the field. Allow enough time to hunt. Depending on the terrain, amount of acreage, and number of birds purchased, the time required can vary greatly. Ask the owner how much time is reserved for your group and what happens if you need additional time. Ask how the birds are set out in the field. I always wait for customers to arrive at the property and check-in before setting the birds in the field. Larger operations might do this before your arrival and your birds often have ranged away from the original set location. Let the owner know if you want a more controlled hunt or a more ‘wild/natural’ hunt. The owner should be willing to accommodate. Do you have an option of setting out your birds in stages? I’ve seen numerous dogs that should have remained on the couch at home because ‘hunter’ never really wanted to hunt, and is gun shy; or I’ve seen rowdy, unruly dogs that continually bust birds out of range. Before setting out all your birds, would the owner allow you to set out half the order first to see how your untested dog behaves? Do you want a controlled hunt for a new or young dog? The owner might let you watch where birds are set out in the field or be able to flag the area where birds are set. This can be a great controlled experience for your dog to reinforce scent, your commands and make behavior modifications. It will increase your percentage of flushes dramatically. Hunt hens only. If your goal is to work with your dog in a controlled setting, consider hunting hens. They tend to be less expensive and generally hold tighter than roosters. An inexperienced dog can gain needed confidence retrieving hens. A wounded mature rooster boasting inch long spurs can be a challenge for a young dog. Proper care for your dog. Chances are your dog knows that a fun day is planned the minute you grab that hunting jacket, say the word ‘hunt’ or whatever else triggers your dog’s alarm. Upon arrival, find an area to run your dog and burn off the extra energy. Are there any fences on the property? Is your dog wearing a good collar? It’s always wise to bring a short leash as well. Like people, feed your dog well in advance of exercise and go easy on the quantity. Bring water for your dog during the hunt. Take a break during the hunt and let your dog relax as well. Remember the extras– your hunting vest (as you should have a full bag of birds if successful), camera, your cell phone if an emergency were to arise and to always wear blaze orange in the field. Be responsible and respectful. Be a good steward of the land. Pick up spent shells, stay within your given boundaries, shoot only the game allowed and follow hunter safety guidelines. The owner WILL appreciate this and be more willing to do you a favor in return or work with you on a special request. With these 10 tips in mind, schedule your hunt and have some fun!